Extend your circuit layout program to allow the user to generate a circuit diagram and corresponding netlist file. Incorporate the dialog from the previous assignment. 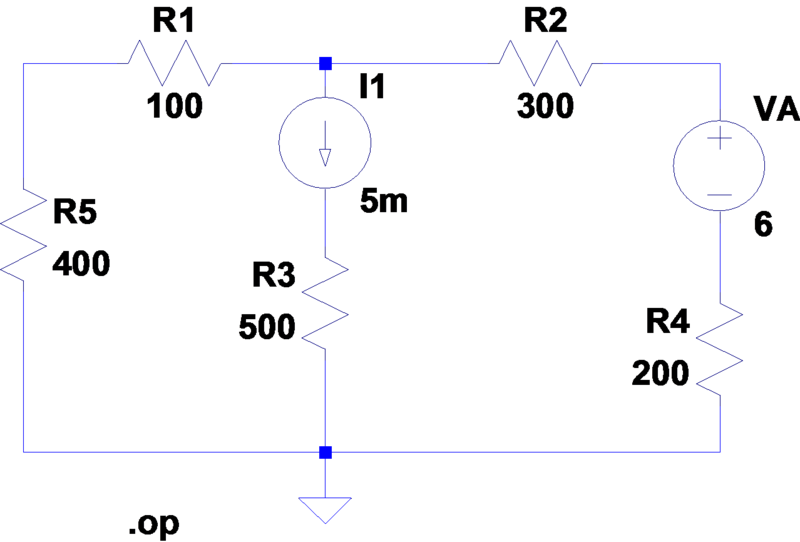 Demonstrate by laying out the following circuit. Add a ground component if you have not previously. Your File menu should have a New menu item to clear any existing circuit and a Save or Save As method to save the circuit as a netlist file. Run your circuit analysis program from the previous assignment to solve for the nodal voltages. Write a demonstration program that formats numbers using standard power-of-ten abbreviations. For example a value of 1500 should be formatted as 1.5K, and a value of 0.018 should be formatted as 18m. You should be able to format groups from femto (10-15) to peta (1015). See Wikipedia reference for examples. Personally I would use upper-case for scales greater than one and lower-case for scales less than one. I would also use u for micro, rather than mu. Notice the use of this system in the current source above. Improve your robot controller from asgn07 (if necessary) and incorporate it into game1. The goal of the game is to steer the robot to the yellow X as quickly as possible. Modify the code so that that the robot leaves “bread-crumbs” (small circular dots) periodically. Use your “bread-crumbs” method to document your route to the destination. Write a Java program to perform Opening and Closing on a binary image. See morphology notes for examples of dilation and erosion on a binary image. Implement the Runge-Kutta method for solving a system of differential equations in Java. See MATLAB notes on numerical solutions of differential equations. Download MATLAB code from integrator.zip. Remember that Java, unlike MATLAB, does not use matrices as basic components so you may need Jama. See hint. Find and demonstrate a sound effect representing celebration. See AudioTest.java for example code.